Another improvement in migrant numbers produce the following between Long Nab and South Cliff - 1 'Scandinavian' Rock Pipit (still at Holbeck), 1 White Wagtail (Long Nab), 3 Wheatear (1 Long Nab, 2 Marine Drive), 1 Black Redstart (still near St Marys Church), 1 Redwing, 21 Chiffchaff and 6 Goldcrest. Elsewhere a Mealy Redpoll was with 6 Lesser Redpoll in West Ayton, at Wykeham South Lake there was a Goldeneye and 6 Curlew, also 4 Dunlin and a Ringed Plover stopped briefly before heading off east, a Goosander and 5 Chiffchaff were at the Mere, 41 Tufted Duck were at Peasholme and 17 Wigeon and 7 Teal were on Johnson's Marsh. On the move (north unless stated) were 1 Red-throated Diver, 5 Fulmar + 3 south, 2 Gannet + 1 south, 4 Cormorant, 2 Shag, 1 Common Scoter south, 1 Sparrowhawk, 2 Black-headed Gull + 1 south, 127 Common Gull + 15 south, 8 Lesser Black-backed Gull, 228 Herring Gull, 7 Great Black-backed Gull + 3 south, 5 Kittiwake + 5 south, 6 Auk sp + 11 south, 1 Sand Martin (first of the year), 40 Meadow Pipit + 19 south, 2 Rock Pipit, 1 Grey Wagtail south, 3 Alba, 2 Rook south, 21 Carrion Crow + 5 south, 1 Brambling south, 4 Goldfinch + 4 south, 13 Linnet + 7 south and 1 Yellowhammer south. 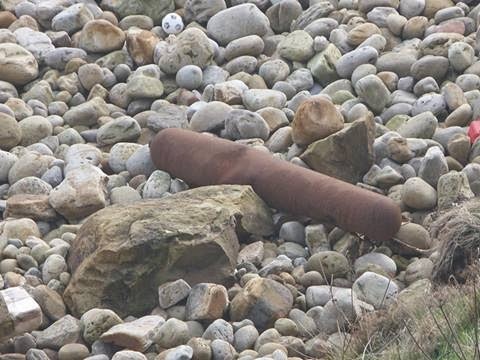 Of interest a suspected torpedo was discovered on the rocks below the Long Nab Hut which is apparently due to be detonated tomorrow!! !